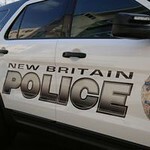 Nicolas A. Marquez, 38, 785 West Main St., first floor, New Britain, was charged on April 9 with second-degree stalking and second-degree breach of peace. Abdulgany Fahd Qatabi, 22, 142 Lasalle St., New Britain, was charged on April 9 with failure to respond-payable violation. Fabian Patrick Callender, 37, 290 Lawlor St., third floor, New Britain, was charged on April 10 with first-degree threatening, disorderly conduct, violation of large cap magazine requirement, criminal possession of pistol/revolver and criminal possession of firearm/ammunition/defense weapon. Luis Santiago, 30, 203 Glen St., floor 1s, New Britain, was charged on April 10 with two counts of violation of protective order. Samantha Marguerite Mabery, 19, 413 Catherine St., third floor, Bridgeport, was charged on April 10 with second-degree identity theft, charging on revoked payment card and sixth-degree larceny. Ramon Segarra, 51, 425 West St., Bristol, was charged on April 10 with second-degree breach of peace. Posted in New Britain Herald, New Britain on Sunday, 14 April 2019 21:41. Updated: Sunday, 14 April 2019 21:43.